Home » Columns » What's the Good News » New Concerts, A KISS For The USO, Soccer Stars And More Are Among The Good News! There’s so much bad news in the world, how about some good stuff? A KISS for the USO, from the Q-C Storm! The Quad City Storm hockey team is nearing the end of their season and along the way they’ve raised over $100,000 for local charities in their inaugural year, as a heck of a hello to our community! The biggest fundraiser yet occurred earlier this month, as they teamed up with the rock band KISS to raise over $30,000 for the USO! 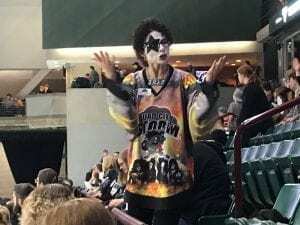 The team worked together with the band to create signature KISS Storm jerseys, which the team auctioned off at KISS night March 9 at the TaxSlayer Center, along with some specially autographed jerseys signed by the members of KISS. 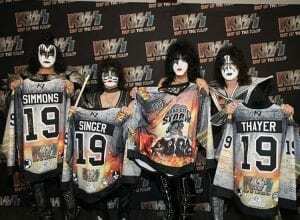 The story of the jerseys and the event ended up going national, as media across the country picked up the tale of the band’s charitable excursion with the local hockey squad. 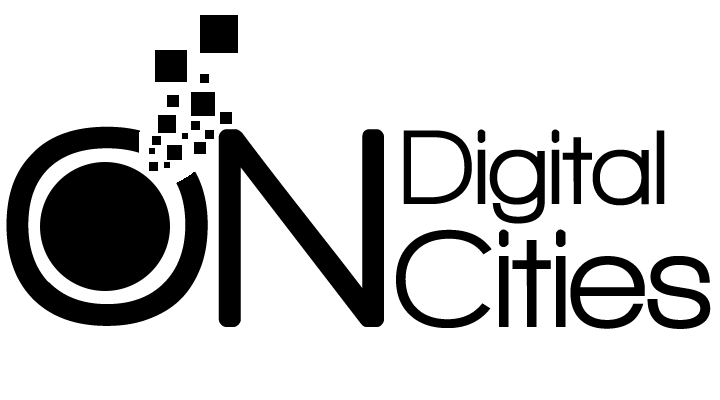 The Storm is gearing up to end their first season in style, and definitely in good graces with the community, as they’ve been a terrific charitable addition to the Quad-Cities. 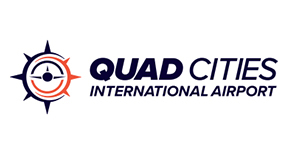 For more information, see our Quad City Storm page here on www.quadcities.com! 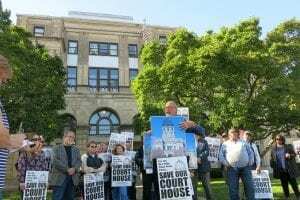 Regardless of the outcome of the Rock Island County Courthouse drama, you have to give kudos to the passionate and persistent volunteers who have donated their time, money and efforts to attempting to save the courthouse. In the face of incredibly daunting opposition and almost certain demolition of the building, these people have shown, on a local level, that the voices of voters and citizens definitely still matter. 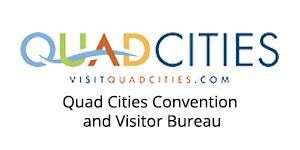 They’ve educated voters along the way about the process of civic pride and improvement and have done a great job of presenting their case to save a historic building and attempt to preserve a part of the legacy of Rock Island city and county. The case is ongoing and continues to take various twists and turns, but it deserves noting that the volunteers behind it should be proud of their achievements and efforts. 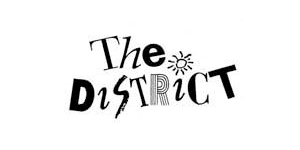 Six years ago, Sean Ryan got the idea for a local music festival based around his band The Dawn and their friends and fellow local musicians. 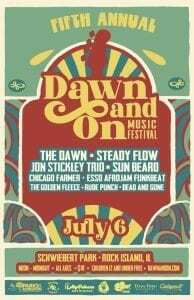 This year, the Dawn and On Festival will celebrate its fifth year with a massive show July 6 at Schwiebert Park in Rock Island, featuring over a half-dozen bands and headlined by The Dawn. The all-ages event is just $10, free for kids 12-and-under, and goes from noon to midnight. For tickets and more information, see www.dawnandon.com. HyVee does a huge amount of charitable work on the down low outside of camera’s range, and so it’s always my pleasure to give them the kudos they deserve, and they deserve plenty for their under-the-radar help of people in Nebraska. Nebraska has been struck by massive floods and environmental damage due to the gargantuan snowfall and spring storms hitting the area, and HyVee was recently “caught doing good” by local folks in the flatland state who sent me these images of HyVee trucks helping to deliver water and other supplies to folks negatively impacted by the flooding. There’s not only a helpful smile in every aisle with HyVee, they’re happy to help behind-the-scenes as well, and they deserve kudos for that. 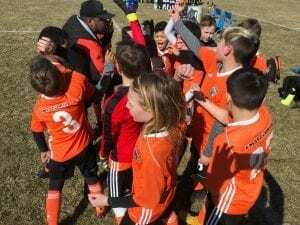 The East Moline Silvis Soccer Club had two clubs ranked in the top ten in the state at the u11 and u13 levels last year, and this spring, the u11 team was invited to participate in the elite invitation-only SASA Elite Challenge, which featured only teams ranked among the top ten in Illinois. 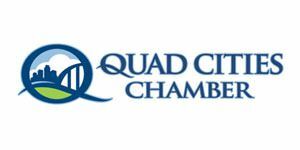 East Moline was the only Quad-Cities club invited to the challenge, and featured players from throughout the Quad-Cities region coached by Anthony Nache and Brad Marshall. The team will begin local play in April and will resume travel tournaments in late-April through June. The newest project for former Bettendorf filmmakers Scott Beck and Bryan Woods is SOVEREIGN, which will star two-time Academy Award winner Mahershala Ali. Beck and Woods wrote the most recent draft of the script, with previous revisions by Jack Thorne (“Harry Potter and the Cursed Child”) and the original script by Geoff Tock & Gregory Weidman (“Zoo”, “Limitless”). The film will be directed by three-time BAFTA-winning director Marc Munden (Hulu’s “National Treasure”, “Utopia”) and produced by 21 Laps (“Stranger Things”, ARRIVAL) and Entertainment One. 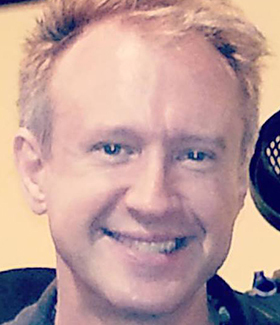 Beck and Woods began their career shooting films in their native Quad-Cities, as Bluebox Limited. They were nominated for a Writers Guild Association Award for their script for “A Quiet Place” which was also nominated for an Academy Award for sound editing. The duo’s first directorial effort, “Haunt,” produced by Eli Roth, will be in theaters this year.